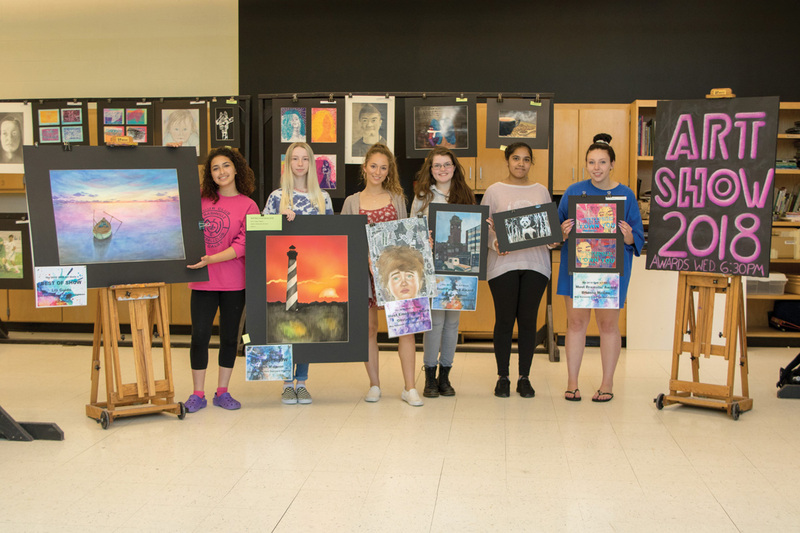 Local art students show a handful the talent produced at IRHS, including, from left, Liliana Guido, Megan Magoon, Olivia Garvey, Brooke Hoban, Jasmine Rodriguez Gonzales and Brianna McGee. Walking in, one is surrounded by faces, some stoic, others laughing. Straight ahead is a kaleidoscope of sunsets. Around the corner, an astronaut struggles in the tentacle of a space monster. A fish and panda bear calmly gaze in opposite directions. The art room at Indian River High School is in full bloom. Teacher Steven O’Boyle tries to instill a strong sense of design in his students early. Students should assemble a college portfolio by the end of junior year, so they’re ready for high-level or community work as seniors. “When they can be compared against real-world artists, that’s the mission,” O’Boyle said. With art budgets so likely to be cut, but the classrooms full, teachers make creative assignments. O’Boyle said smaller projects mean students have a sharper sense of quality. Projects aren’t just big and grandiose. They’re also small and precise. His students described him as a great teacher, encouraging, sometimes stubborn, but also, the best. “Mr. O’Boyle, he just pushes us really hard, and he believes in us. So, we believe in ourselves, and that goes a long way,” said sophomore Liliana Guido. “He just wants us to be creative. He doesn’t want us to be super-over-the-top with everything. He just wants us to be ourselves,” said senior Olivia Garvey, who is going to Flagler College. Projects include printmaking, collage, self-portraits, scratch art, watercolor, sneaker designs and more. O’Boyle said he was especially impressed with the students’ meaningful designs for their “art with a cause” project, which showed some social commentary. “Art is special to me because when relieving stress, you can pour all your emotions into your art,” said senior Jasmine Rodriguez Gonzales, adding that she hopes to keep making art after she graduates. Although she was surprised to be included, Rodriguez Gonzales said she was happy her artwork made the show. “Art is special for me because I get to express myself through my art,” said Magoon, who revels in painting watercolors. “I never thought I was going to be an artist,” said senior Brooke Hoban, standing before a simple painting with a complex backstory. It’s a London streetscape with an antique pickup truck, based on a photo she snapped in England. But here’s the twist: that truck was never there. Hoban came home, found a teacher with an antique truck, angled it to match lighting from her original photograph and snapped another picture. Only then did she combine the two in one painting. “A lot of people have said, at first glance, this doesn’t look like a painting,” Hoban said. Indeed, up close, the brushstrokes are obvious. But from even a few feet back, the painting transforms into seemingly aged photographic realism. “I think it’s phenomenal for my first acrylic piece,” said Hoban, who will attend the Maryland Institute College of Art (MICA). Although she said she hopes to make people laugh by studying animation, she said she enjoyed the “nitty-gritty” pieces that helped her earn admission. He said he loves bringing characters to life with pen and ink. Good art is a struggle, said Carpenter, who spent hours each day trying to build a portfolio, despite beginning the art pathway later in life. This year, he earned a spot at the Delaware College of Art & Design (DCAD). During the two-day classroom art show, IRHS allowed other classes to tour the art room and see the exhibition. Now, the public can see for themselves. Dagsboro Days coffee shop has invited students to display artwork in the coffee shop at 33103 Main Street, Dagsboro. The pictures are also available for purchase until June 1. See more student artwork at www.coastalpoint.com.